I need to see some evidence of life before I can declare it alive. The textbook says that a thing must move, grow, reproduce, metabolize, and respond to stimuli to qualify as alive. There is life and then there’s life, abundant. I’ll take abundance any day. Run, shoot, pass, dribble, score. Repeat and repeat, calling on the same muscles to do all the work. Do the same the next day, next practice, next game. It seems a reasonable plan for training and improvement. Just keep doing it until we get it right, right? Well, no. Because each movement is not just the responsibility of one muscle. Oh, there is one muscle in charge; we call that the prime mover. That’s the muscle the gets strengthened when we do it over and over. But there are other team members here. There are the agonists, the helping muscles: smaller role but their additive effect is essential. Then there is the antagonist, the opposing muscle: whose job it is to slow or stop the motion. Finally, there are the stabilizers: the muscles that keep the movement aligned. So, when we repeat and repeat, the strong get stronger but the weak get weaker. They become less and less able to play their role and balance the movement. This does not stem from an internal ranking system or superiority of performance. They are designed this way with different roles, different contributions, some larger, some smaller, some one direction, some another. There’s a division of labor, by design. We get into trouble when we favor one over the other. Neglect the weak and the strong suffer. Amazing how even our bodies are designed for community. Favoritism is discouraged. Honoring each for its contribution based on its giftedness is wise. And the weakest and smallest need special attention and special protection. Neglecting these, letting the prime mover rule the roost and demand all the attention disrupts the balance. It’s a recipe for injury for the body. When small roles are considered unimportant and small contributors considered insignificant, we deny our design. We fall into patterns of disparity, the strong feeling superior, the weak feeling dismissed. Closing this gap is essential for health. Not to bring each muscle into equal strength – that would be disaster for movement. Not to bring each muscle into equal leadership – that would freeze us in our tracks. Just to offer each its due. To train each up into its full potential and to activate it in the way that exerts just the right force at just-right speed in just-right direction with just-right balance, without deviating from the appointed pattern. Only community can accomplish this. Honored community which recognizes the contribution of each in its proper proportion, according to its own design. We deny this at our own peril. How cool of God to offer us this lesson in our bodies so we can live it out in His. Got any skeletons in your closet? Any exoskeletons? You know, beetles and lobsters have them. That hard outer shell that protects and supports. They wear their skeleton on the outside. What if we wore our skeleton on the outside? Our underwear as outerwear, so to speak. 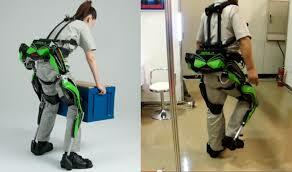 I’ve got exoskeletons on the brain because they’ve been in the news. Matt Damon adopts a personalized version in his new movie “Elysium.” Apparently Damon’s character has his electro- mechanical exoskeleton implanted, permanently affixed and brain-circuit controlled, so he can fight his way to another planet in pursuit of the cure for the illness which, otherwise, is depleting his strength. Great plot! While that’s cool science-fiction, it’s also not that fictional. Clever engineers are currently designing all sorts of devices to allow the human body to carry more than they are physically able. This is especially cool for people with nerve and spinal cord injuries because it’s allowing them to stand and walk and have use of their bodies which, otherwise, are weak or poorly responsive. Great stuff! But wouldn’t you know we’re thinking about how they might make us super-human? Has anyone considered what our lower backs are gonna feel like after we have hefted 500 pounds thanks to our helping exoskeleton? That poor spinal column with cushy disks supporting our weight. Its curves are evolution’s best effort to support our upright posture. Skeletal support on the outside…interesting. Got me wondering why God created us with our skeletons on the inside. Mere bones to support us and hardly any protection at all. Did he really think a rib cage could protect our lungs and heart? The cranium does a bit better with our brain, but it’s not even shatter resistant and no help at all in concussion-force collisions. No wonder ancient warriors donned armor and today we drive armored tanks. These bodies are rag dolls in the battle field. God made us soft. With layers of intertwining muscle so we can move gracefully and intricately and with force and speed. Our outer coating? A skin barrier stretched overtop in a rainbow of hues which fends off the sun’s rays and deflects the world’s germs. Then He offered another layer, a clear coating at no extra charge. He clothed us with His righteousness. Talk about an exoskeleton! But unlike Matt Damon, my exoskeleton is not surgically implanted; it’s removable. I can hang it in my closet and choose when to put it on. In some seasons it may get pushed to the back. I may even forget I’ve got that old thing. Clear like it is, I may not even see it until life gets downright unmanageable. When it’s a war zone out there and someone’s got to do the heavy lifting. Imagine. A fortress of strength, power, agility, and flexibility left hanging in my closet. Why would I not put it on to face my regular days? I wonder if it comes in designer colors or maybe multi-colored like Joseph’s coat. But then it would clash and I would have to do the matching thing. Nope. Probably better to have the sheer version. Of course, then people can see what’s underneath. That, I am responsible for maintaining – the physical barrier and all the moving parts. Because what good is an exoskeleton if what’s underneath gives way?